Device could end up retailing for $100 on contract, with 4 wooden covers available for $50 each. Popular leaker evleaks was busy yesterday with images of Samsung's Galaxy Gear, and he's at it again today with info about the Moto X. According to the leaker's Twitter feed, Google's flagship smartphone will soon undergo a 50% price cut, saving customers a few bucks just in time for Christmas. One of the biggest knocks against the Moto X has been its price tag, with it retailing for $200 on contract. Consequently, Google looks set to bring that price down to just $100 at some point in Q4, though it is unclear whether early adopters will receive any credit or refund. 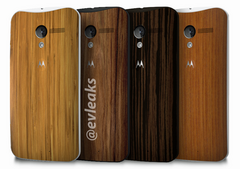 In addition, the tweet added a photo of 4 different wooden covers for the Moto X, claiming that each will sell for $50. At this point in time, the Moto X is already available on AT&T and Verizon, with Sprint and T-Mobile on the way. Sadly, Moto Maker remains an AT&T exclusive and Motorola has no plans of making the device available outside the US, with the only "off-contract" version requiring an AT&T account with good standing and $579.